No mushroom presents more of an enigma than the fly agaric, Amanita muscaria. It is the most recognizable mushroom on the planet, and is widely known as the hallucinatory ‘shroom responsible for Alice’s trip into Wonderland and quite possibly our beloved images of a red-suited Santa Claus and his flying reindeer. I am not into hallucinations. Or stomach cramping, for that matter. So for years I let this beautiful mushroom pass on my mushroom hunts. Until last weekend. We were ostensibly hunting for porcini, Boletus edulis, but as any king bolete hunter knows, the fly agaric is literally a red flag indicating that a porcino might be nestled nearby: They flush around the same time, in around the same place. 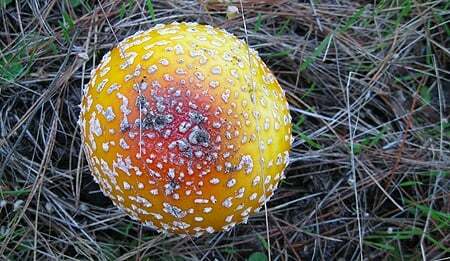 And where we were on California’s Central Coast there were thousands of muscaria, a red tide in the woods. As we walked, picking porcini and other wonderful boletes, I began having a nagging conversation with myself: You know you can eat those amanitas, right? Yes, but don’t they need all sorts of crazy processing first? Probably. But you will never get a better chance to experiment than with this flush right here, right now. OK, OK. I grabbed a separate bag and began picking. I filled a grocery bag in no time. In fact, I could have filled the back of my pickup with muscaria. But I also had a huge haul of porcini, the prize of the day. So I dealt with them first. My dehydrator ran morning and night for days. I made porcini powder, dried quarts of porcini, made porcini risotto, and even gave some fresh ones as Christmas presents. All the while my sack of amanitas lay neglected in the garage. There is also, apparently, an entire modern subculture dedicated to tripping on this mushroom, and its use in visions dates back thousands of years — especially among those who live in the boreal forests of the north. This is where Santa comes in. My colleague Greg Marley, whose excellent book Chanterelle Dreams, Amanita Nightmares: The Love, Lore, and Mystique of Mushrooms goes into this at length, says that fly agaric has been a symbol of yuletide happiness in Central Europe, Russia and Scandinavia for centuries, calling it “a red light shining bright in the winter darkness.” And the people of the North, as any mushroom hunter knows, are mad about mushrooms. There is a common exchange between us Anglo ‘shroomers when we see various, “lesser” species of ‘shroom: Is it edible? Well, the Russians eat it… Amanita muscaria falls into this category. Historically, the Siberians boiled fly agaric and then drank the pot liquor to get roaring drunk. They then preserved the mushrooms for eating later. As it happens, the Siberians’ livestock also loves this ‘shroom. And I’m not talking about cattle, I’m talking about reindeer. Yep. Caribou will seek out Amanita muscaria just for the high — or at least it looks that way to us humans. So it’s not too far a stretch to conjure up an image of a jolly, roaringly drunk, fat, bearded dude all dressed up for the North Pole — in a red suit with white trim — chillin’ with flying reindeer. But like I said, I am not into that sort of thing. So I looked deeper. It seems that the primary toxins, er, “active ingredients,” in Amanita muscaria are ibotenic acid and muscimol. Unlike the amatoxins in the deadly amanitas — the death cap and the destroying angel — ibotenic acid and muscimol are water soluble. More research turned up William Rubel, who knows his stuff when it comes to mushrooms. Rubel wrote an article about how to detoxify fly agaric that proved enlightening. What’s more, he and David Arora, who is even more reknowned in the mycological world, teamed up on a longer piece (which is linked to at the bottom of Rubel’s article) about cultural attitudes toward Amanita muscaria that provides all the detail you could need on why this mushroom has such a varied place in our minds: Food. Poison. Hallucinogen. As food, fly agaric does need special handling. Apparently most people eat only the caps or the very young buttons. They must be boiled in a large volume of water for a period of time, and then you need to toss out that water. 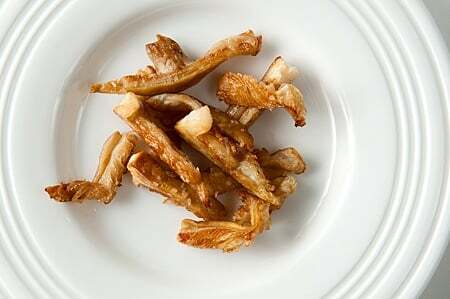 After that, most cultures will either fry them like normal mushrooms, or pickle them, or preserve them in oil; I happen to know that a certain set of Italians do this. The Japanese around Nagano eat Amanita muscaria as pickles, as do the Lithuanians, Finns and Russians. My friend Langdon Cook wrote about eating fly agaric with none other than David Arora, and he pronounced them delicious. Lang also pointed me to a cautionary article written by two mycologists who, apparently, failed to detoxify their muscaria enough. The moral of that article is to use lots of water and boil the hell out of the shrooms. Back to my grocery bag. By the time I’d screwed up enough courage to mess around with these things, about half had gone by. Bummer. But I still had about 10 good caps to experiment with. What follows is what I did to detoxify the mushrooms. If you choose to play around with Amanita muscaria, do so at your own risk. I first removed all the caps and cleaned them with a brush and the side of a knife. Then I cut the caps into 1/4 inch slices. I filled my 12-quart stockpot up to the top, leaving about 3 inches of room to spare. I added enough salt to make the water taste salty and 1 cup of cider vinegar. Several sources say that adding salt and vinegar helps extract the toxins. I brought this to a boil and added the mushroom caps, then let it roll for 15 minutes. I then drained the mushrooms and filled the stockpot half full with fresh water and brought that to a boil. In went the mushrooms for another 5 minutes. Why? If they had gotten too vinegary or salty, this would help. Also, better safe than sorry. The key to boiling seems to be time and water volume. You need enough water to leach out all the toxins of the mushroom, so it follows that the more muscaria you boil, the more water you’ll need. As for time, it seems 15 minutes is a pretty good interval, according to my sources. When the slices were done with this treatment, almost all the color was gone from the previously pretty red caps. Oh well. They were still a vague ivory-yellow, but the mushrooms themselves were pale and slippery. Not appetizing. Lang and Arora ate them fried in butter, so I did the same. I experimented with about 1 cap’s worth of slices. It is always wise to start small with any new mushroom, and especially one that has potentially toxic effects. I put the slices into a non-stick pan and let them dry saute for a few minutes. They did not exude too much water, oddly, so I added some butter and a little salt. I was happy to see the slices fry up crispy. Now we’re talking! I put them on a little plate, and tentatively took a bite. I’d be lying if I told you I was not at least a little nervous. I tasted butter and salt at first, always nice, but then I got a little crisp, then the squinchy crunchiness of the mushroom, then that nutty flavor everyone who’s eaten muscaria talks about. Reflexively, I reached for another slice, then another and another. I had to force myself to stop at 1 cap’s worth. They were that good. Now it was time to wait. The mycologists who’d boiled their muscaria in too little water for too short a time started tripping at 20 minutes. So I sat down to watch Boise State beat the crap out of Arizona State and waited. I was wondering if Boise’s crazy blue uniforms would spark some weird hallucination. But no. I looked at my watch: 45 minutes and nothing. The game got boring. Holly and I then watched a show about a bunch of Vikings getting beheaded in England 1000 years ago, which, in retrospect, was probably not ideal if I were about to go on a mushroom trip. But no. I looked at my watch again: Two hours had passed and nothing. If a trip were coming, it would have hit by then. What’s more, I had neither stomach cramps nor any other ill effects whatsoever. Success! Now you may be asking yourself why I would bother messing around with Amanita muscaria when I had just hauled in pounds of boletes? First off, fly agaric is one of the easiest mushrooms in the world to identify. Even though it has some color variation, like the yellow-orange one below, if you stick to the red and orange color phases Amanita muscaria is unmistakable. Now white and light-yellow phase muscaria do exist, but I do not recommend messing with those. White amanitas are almost always deadly — the destroying angel chief among them — and mistaking a destroying angel for a white muscaria will be the last mistake you ever make. And with the yellow ones, you can mistake muscaria for the more-toxic Panther Amanita, Amanita pantherina, which does not have a history of culinary use. 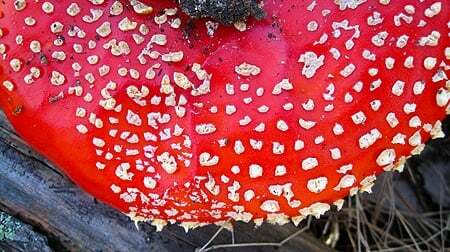 A second reason to consider eating fly agaric is because it is a large mushroom that, as I saw on the Central Coast, can flush in huge numbers. I could easily have collected four grocery bags of them on my last trip, which would have made for lots of good eating down the line. And good eating is the real reason I will choose to eat Amanita muscaria once or twice a season. It was a delicious mushroom fried in butter, and I suspect it will make an even better preserved mushroom, if the Italians or Russians’ experience is any indication. At the very least, it will be a conversation starter, eh? 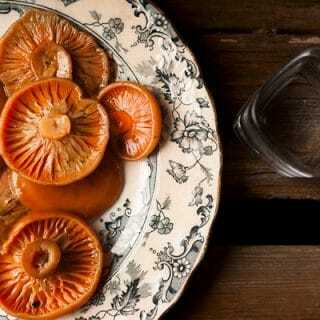 Find dozens of recipes for all sorts of wild mushrooms on Hunter Angler Gardener Cook! I appreciate you writing this with a game attitude. Clear instructions, proceed with caution, but a willingness to experiment and be playful about it too. 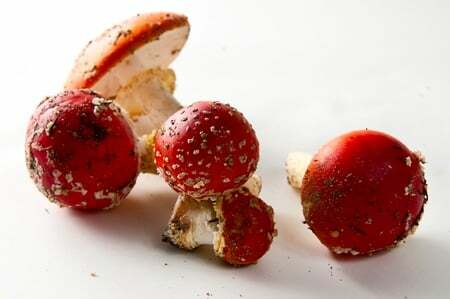 Early on, when people on the north coast of California started eating these with the help of mycological expert and world traveler David Arora (about 15 years ago), the amount of boiling and prep was less well established. I ate them cooked in one process of boiling of water that first time which meant they retained some of their lovely color and some of their psychotropic properties too (albeit almost homeopathically). It was a delicious breakfast with a very, very mild high afterward. Nowadays the double boiling is clearly the safer preparation. My guess is the second boil is basically ridding the flesh and gills of the water from the last boiling which was is now essentially a muscaria tea (and probably potent). I had no idea the fly agaric could be eaten without psychoactive effects. That’s wild. I find it even more interesting because psilocybin mushrooms can be consumed by making tea in a similar process that eliminates the psychoactive effects of the Mario mushroom.